The translation profession has been undergoing a rapid process of professionalisation. In models of professionalisation, translator certification is considered one of crucial elements of the process. The paper begins with a discussion of professionalisation and its models in the context of translation to move on to certification programmes and their categorization. The main goal is to discuss the impact of certification on translator education, i.e. the washback effect, showing both positive developments that have been triggered as well as constraints that have been generated as professionalisation takes on the form of institutional control and regulation. The discussion is illustrated with examples from the Polish system of translator certification. ©inTRAlinea & Joanna Dybiec-Gajer (2014). "Going Professional: Challenges and Opportunities for the Contemporary Translator Educators"
Translator education is a dynamically developing branch of Translation Studies, which has evolved from a method of foreign language teaching to an independent, highly specialised domain in its own right, aimed at various aspects, both theoretical and practical, concerned with educating translators. In other words, translator education has gone professional in the sense that it has accumulated a vast body of research, formulated its premises, developed standards and proposed theoretical solutions along with practical applications. This is well illustrated by the process of academisation with ‘the explosion of translation programmes’ (Drugan 2013: 7). Translator education is also going professional in the sense that, depending on a country specific context, it has started or is starting to consider and implement the implications resulting from a close link between translator training and market needs. There is a far reaching consensus in the literature that needs-based training aimed at developing a set of competences conceptualised as professional translation skills, including a high level of technological skills (see for instance EMT competence model, 2009), should prepare trainees to meet the demands of real-life settings in which individuals under the job profile of translators work (professional realism). Yet translator education, along with TS at large, also seems very much concerned with professionalisation in the sense of raising the status of translation and translators in general, from a still valid call to put an end to ‘translators’ invisibility’ to support for various inter-institutional and cross-national initiatives to increase the quality of training. Professionalisation of translator education, in the sense outlined, is also closely linked with professionalisation of the translation profession. The aim of the paper is to investigate this relationship, focusing on implications of the professionalisation process of translation as occupation on translator training. In other words, it addresses the opportunities and challenges of professionalisation for contemporary translator educators. In particular, the focus is on certification, which is considered to be a crucial element of professionalisation. The concepts of professionalisation, along with profession and professionalism, have been subject of scholarly analysis, most of which concentrated on the domain of sociology. Professionalisation can be defined as ‘the process whereby occupations seek to upgrade their status by adopting organisational and occupational attributes and traits’ (US National Center for Education Statistics 1997, in Pym et al. 2012: 80). The question of raising status becomes even more prominent in definitions stemming from sociology of professions, where ‘the concept of professionalisation is regarded as the process to pursue, develop and maintain the closure of the occupational group in order to maintain practitioners’ own occupational self-interests in terms of their salary, status and power as well as the monopoly protection of the occupational jurisdiction’ (Larson 1977; Abbott 1988 in Evetts 2012). Such an understanding of professionalisation as a critique of an ideological construct and of elitism was popular in the 1970s and 1980s; it continued in the 1990s in studies which shifted toward the idea of professionalisation as a historical and gendered construct. In recent studies, as sociologists of profession demonstrate, the concept of professionalisation can be a very useful tool for the analysis of newly emerging occupations (Evetts 2012), thus it offers interesting conceptual approaches to translation as profession. While some occupational groups such as doctors or lawyers are traditionally regarded as fully professionalised, translators, such as, for example, sign language interpreters are on their way to professionalisation (cf. Figure 1). Figure 1. Professionalisation continuum (Witter-Merithew and Johnson 2004: 19). establishing formal codes of ethics as sets of rules to present the ideal service, eliminate the unqualified, protect clients; undertaking efforts to separate the competent from the incompetent. Professional autonomy – characterised by a close collaboration of stakeholders, introduction of tighter control over the profession (creation of codes of ethics, certification) and working towards achieving market control and influencing legislation. Tseng’s model was further developed by Ju (2009) (see Figure 2). The discussed model seems to tap into an understanding of professionalisation as gaining control over many aspects of the profession’s functioning in society. The model stresses the importance of various bodies such as governmental and training institutions and shows their contribution to the professionalisation process. Characteristically, the highest phase of development is perceived to lie in professional autonomy guaranteed by protection and licensure for the establishment of which influential stakeholders are important. In its extended version, the model places particular emphasis on certification as a mechanism leading towards professionalisation. Likewise, arguments in favour of more regulation can be found in the DGT-funded report on the status of translation profession in the EU. Noting ‘market disorder, low status [of the profession] and a corresponding decline in perceived standards’ (Pym et al. 2012: 4), the authors envisage the following actions that can be undertaken as remedy: ‘European regulation of authorised/sworn translation; European (and/or global) accreditation of certifying bodies; accreditation of translator-training programmes; and the development of standardised examinations for translator certification’ (Pym et al. 2012: 4). Given the emphasis placed on the role of credentialing in the professionalisation process, it is worthwhile considering definitions and types of certification. To illustrate the categorisation, which may involve some natural overlap, an example from the area of sworn translator certification is provided as the profile of legal, or sworn translator, can be categorised as the most professionalised of all translator profiles. The example comes from a Polish setting, which is of particular relevance as Poland is considered one of the countries with the highest level of regulations and standards concerning the profession of legal translators (Hertog and van Gucht 2008: 142). The Polish certification system is organised at a national level, with provisions stipulated in an adequate act and corresponding resolutions. Translator certification exams as high-stakes testing raise a number of issues for stakeholders involved and trigger off changes across educational landscapes, and, ideally, are hoped to enhance translator status and value in market terms. Below some of the issues are outlined, with focus on the perspectives of translator education. Examination-based translator and interpreter certification raises problems characteristic of testing in general, i.e. predominantly of validity and reliability, widely discussed in the literature (e.g. Bachman 1990; Komorowska 2005: 22–31; Angelelli 2009: 15–23). In other words, do the designed instruments test what they are supposed to test? Do they give the same results for individuals with similar skills irrespective of time and place of test administration and test raters? Design and development of testing instruments is a complex, time-consuming and expensive process which should integrate research in translation studies and testing. According to estimates, a full-circle of development of a testing tool according to premises of educational measurement takes about two years (Niemierko 2009: 75). Additionally, in many settings the entire certification system is regulated with more or less rigidity. While certification schemes run by professional associations may be more flexible to adopt changes, government-run or supervised programmes tend to be more restrictive. In the Polish example, many elements of the testing procedure, including assessment criteria, are stipulated by the law. As a result, any alterations, amendments or needed improvements to such a formalised certification system are difficult to be made. In many countries the success rate in certification exams is very low. For instance, below 20% in the USA (ATA), 20-30% in Australia (Pym et al. 2012: 77), 15-25% in Poland (Kubacki 2012: 191–197), 5% in Norway (Kubacki 2012: 47). This is typically explained by insufficient competence levels of candidates, interpreted as a result of poor exam preparation and inadequate training (Mikkelson 2013: 70; Kubacki 2012: 197). High failure rates in certification exams, as high stakes testing, naturally evoke strong emotions. While some may stress the unjustifiable difficulty levels of such exams, translator educators tend to criticise unrealistic and unauthentic modes of administration (such as handwritten exams for translators) or unclear marking systems. In Poland, the sharpest criticism has been directed at reliability of sworn translator testing and unavailability to the public of the examination regulations with a marking system (Zieliński 2011: 127–128; Dybiec 2013: 149). As scholars report, in the USA even a lawsuit was filed; however the rigor of the examinations has been in general maintained (Gonzalez, Vasquez and Mikkelson 1991). Such a situation is an opportunity for translator training institutions (usually universities) to stress the importance of translation and interpretation education and also to forward their own agenda. Universities can contribute to raising competence levels of candidates by offering specialised training programmes. In Poland, many, if not most of translation and interpreting degree programmes include now modules preparing for the state examination for sworn translators, separate extracurricular courses are also available. This leads to another important aspect, known in the literature as washback effect, i.e. in this case the influence of high-stakes testing on teaching and translation education research. Examination effects on training practice can be positive, negative or both. On the positive side, it is important to note the appearance of new training programmes and curricular changes in the existing ones. New teaching materials and translator’s tools are developed. Further, certification exams provide incentives for research in the field of translation education: on LSP-translation, translation examinations, translation assessment, translator competence, curriculum design. From the classroom perspective, certification exams can provide a useful reference point and resource for teachers. However, given the rigidity and formalisation of certification exams and their role of gate keeping, it is important to bear in mind that their pedagogical usefulness may be limited. Most of the translator certification exams, also in the revised formats as in the case of Australia, are traditional translation exams, depending on text translation (see Kelly for criticism of such testing, 2005: 132) as the only indicator of translator competence, while the innovative teaching practice calls for the development and application of a variety of tools for measuring the student’s progress and competence from translation diaries to eye-tracking methods (cf. Dybiec 2013). Finally, on the negative side, some curricular changes in the academic landscape may in fact be a facelift to attract students and to compete on a tighter educational market while some publications or one-off courses aimed at preparation of test takers seem to capitalise on the demand generated by the introduction of translator certification. This applies especially to contexts where translator certification schemes are a relatively new development (e.g. in Poland since 2004, by comparison the ATA certification examinations go back to the 1970s). As the translation profession strives for more recognition, translator certification schemes are perceived as an instrument towards this goal. For translators, taking and successfully completing certification exams involves cost and effort, so naturally the question arises if this translates into market terms such as better assignments, better pay, more prestige. Investigating the translation profession from the perspective of information economics, Chan concludes that ‘in our questionnaire surveys, the translators (the supply side) and the people responsible for hiring translators (the demand side), both believed that the certification process has not functioned effectively as a signalling device’ (Chan 2011). In many contexts, downward pressure on rates has been noted which is difficult to offset with certification. In the Polish example, the certification exam plays a crucial role as its successful completion allows entry to a segment of court and official document translation. Thus, on the one hand, for translators or translators-to-be who plan to specialise in legal translation and envisage a career in court translation it has a clear value of qualification that is a prerequisite for practising the profession of sworn translator. On the other hand, the introduction of certification has not affected the rates for sworn translation. It seems that the certification has led to some enhancement of the status and ‘visibility’ of sworn translators, yet has not brought about any changes in terms of their pay. 5. The translator educator as a professional? Given the growing number of translator programmes, the call for professional realism in the classroom (e.g. Kelly 2005; Olvera Lobo 2007; Gouadec 2007) and the general pressure toward professionalisation in its multifarious meanings, the question of the translator educator’s profile becomes relevant. According to steps towards professionalisation quoted earlier (Wilensky 1964), in order to be considered a professional in a given field, this activity should be carried out full-time, that is with allocation of all resources meant for a particular activity which leads to this activity being the major source of a person’s income. Following this argumentation, professional translators can be professional only in a (particular) domain of translation while TS scholars can be professional only in their field of research. Thus the profile of a translator trainer cannot be a simple additive model, putting on top of the professional translator’s competences some pedagogical skills or adding some translation experience to the profile of a TS scholar. The translator educator’s profile, on the one hand, concerns the issues of professional identity, on the other, competences and skills required with regard to teaching and functioning in the academic context where, traditionally, most of the training takes place. Finally, it includes a psychological component, from predisposition to interpersonal qualifications. It seems that the professional identity of translator educators is in the process of emerging: in practice, theoretical considerations, and institutional settings. As for the practice, in a recent empirical study on translation assessment from the pedagogical perspective, most of respondents involved in teaching translation defined themselves either as academics (university lecturers/professors) or ascribed themselves a dual identity as academics and translators. Only a small percentage of respondents used the term ‘translator trainer/educator’ to characterize their professional activity (14% in an international sample and less in a Polish one) (Dybiec 2013). Although the study was small-scale, yet it was conducted in a high-calibre setting so its findings may suggest some tendencies in self-perception of this professional group. As the findings indicate, there seems to be little (articulated) awareness among practitioners concerning the specificity and importance of preparing for translator training. This may be explained by the academic set-up where until now regular programmes in translation and interpretation pedagogy were basically non-existent. It is beyond the scope of this article to discuss the issues of translator trainer competence which, without doubt, deserves more academic attention. Here, I would like to highlight the significance of interpersonal and instructional competence against the backdrop of recent professionalisation developments in the translation profession. These include proliferation of translation and translation related standards, introduction or re-design of translator certification programmes, revision and extension of codes of ethics, effecting also educational settings. In translator training major influence has been exerted additionally by the EMT programme. Some of these changes have propagated process-based approaches and managerialist agendas, favouring more regulation in the profession, in my view leaving translators and translators-to-be as truly autonomous figures out of the picture. Some competence components from the EMT Translator Trainer Profile seem to work against this neglect for the human factor, the critical link in translation understood as intercultural and interpersonal communication. For instance, while the EMT translator profile (EMT 2008) specifies that interpersonal competence involves ‘knowing how to comply with professional ethics’, the EMT translator trainer profile (EMT 2013) specifies that it involves ‘ability to identify, adopt and critically assess codes of professional ethics for translators and trainers’ as well as ‘ability to teach students how to apply and critically assess codes of professional ethics for translators’. The phrase ‘critically assess’ makes a difference from a call for obedience, introducing the concept of ‘self-reflexivity’ and autonomous thinking. 6. Instead of conclusion: Is professionalisation a desirable goal? Not without reason, recent TS literature articulates and favours calls and initiatives for the improvement of the translation status (Pym et al. 2012). Such opinions are also voiced in some newly revised codes of translators’ professional ethics (cf. TEPIS). Although rather rare among translation scholars, criticism of professionalisation, not uncommon among sociologists, stresses that ‘going professional’ entails ‘a shift from the notions of altruism service to pursuit of power and prestige’ (Witter-Merithew and Johnson 2004). 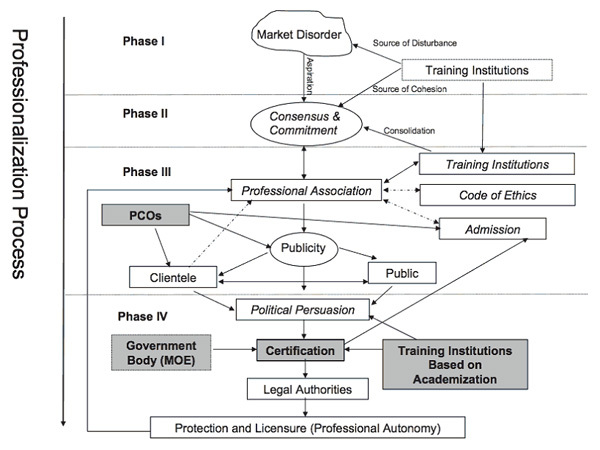 In the discussed models of professionalisation the phase of ‘protection and licensure’ (Tseng 1992; Ju 2009) is presented as the highest development. Further, an important study on the translation profession in the EU notes that ‘[t]he process of professionalisation can [...] be seen as the production of efficient signals of status such that good translators stay in the market’ (Pym et al. 2012: 3). Such an understanding of professionalisation favours developments which lead to the creation of clear signalling mechanisms, in other words, formal systems and structures, i.e. regulation and institutionalisation. Depending on a country- and institution-specific setting, more professionalisation in many of its multifarious meanings may be indeed necessary both for translation and even more so for translator training units to raise the quality of training and forward their agenda. Yet for translator education it seems vital to maintain balance between what Evetts (2012) calls occupational professionalism with values of competence and trust on the one hand, and managerial or organisational professionalism (expressed in the discourse of professionalism) as a tool of control, hierarchy building and exclusivity, on the other. Angelleli, Claudia V. (2009) “Using a Rubric to Assess Translation Ability” Testing and Assessment in Translation and Interpreting Studies, Claudia V. Angelelli and Holly E. Jacobson (eds), Amsterdam/Philadelphia, John Benjamins: 13–47. Bachman, Lyle (1990) Fundamental Considerations in Language Testing, Oxford, Oxford University Press. Chan, Andy Lung Jan (2011) Information Economics and the Translation Profession: An Empirical Investigation into Translator Certification and Other Signaling Mechanisms in the Translation Marketplace, Saarbrucken, Lap Lambert Academic Publishing. Drugan, Joanna (2013) Quality in Professional Translation: Assessment and Improvement, London, Bloomsbury. Dybiec-Gajer, Joanna (2013) Zmierzyć przekład? Z metodologii oceniania w dydaktyce przekładu pisemnego, Kraków, Universitas. Dybiec-Gajer, Joanna (2013) “Tłumaczenie jako świadczenie usług tłumaczeniowych? Między realizmem zawodowym a dyktatem rynku w kształceniu tłumaczy”, Między Oryginałem a Przekładem – Dydaktyka przekładu no. 19/20: 169–187. EMT Expert Group, “Competences for professional translators, experts in multilingual and multimedia communication” http://ec.europa.eu/dgs/translation/programmemes/emt/key_documents/emt_competences_translators_en.pdf (accessed 29 March 2010). EMT Expert Group, “EMT Translator Trainer Profile. Competences of the trainer in translation (Version 12 Sept. 2013)” URL: http://ec.europa.eu/dgs/translation/programmemes/emt/key_documents/translator_trainer_profile_en.pdf (accessed 15 February 2014). Evetts, Julia (2012) “Professionalism in Turbulent Times: Changes, Challenges and Opportunities”. Paper delivered at Propel International Conference, Stirling, 9-11 May 2012, http://www.propel.stir.ac.uk/downloads/JuliaEvetts-FullPaper.pdf (accessed 15 September 2013). professionalisation”, Meta 55/4: 789-816, URL: http://www.erudit.org/revue/meta/2010/v55/n4/index.html (accessed 20 April 2013). Gonzalez, Roseann Duenas, Vasquez, Victoria. F., and Mikkelson, Holly (1991) Fundamentals of Court Interpretation: Theory, Policy, and Practice, Durham, NC, Carolina Academic Press. Gouadec, Daniel (2007) Translation as a profession, Amsterdam/Philadelphia, John Benjamins Publishing Company. Hertog, Erik, Jan van Gucht (eds) (2008) Status Quaestionis. Questionnaire on the Provision of Legal Interpreting and Translation in the EU. Antwerpia–Oxford–Portland, Intersentia. Ju, Elma Mingli (2009) “The professionalisation of interpreting in Taiwan: A critical review of Tseng’s model”, Compilation and Translation Review no. 2(2): 105–125. Kelly, Dorothy (2005) A Handbook for Translator Trainers: A Guide to Reflective Practice, Manchester, St. Jerome. Kubacki, Artur Dariusz (2012) Tłumaczenie poświadczone. Status, kształcenie, warsztat i odpowiedzialność tłumacza przysięgłego, Warszawa, Wolters Kluwer. URL: http://www.trans-int.org/index.php/transint/article/download/189/109 (accessed 11 October 2013). Niemierko, Bolesław (2009) Diagnostyka edukacyjna, Warszawa, Wydawnictwo Naukowe PWN. Olvera Lobo, M. D. et al. (2007) “A professional approach to translator training (PATT)”, Meta, no. 52(3): 517–528. Pym, Anthony, François Grin, Claudio Sfreddo, and Andy L. J. Chan (2012) The Status of the Translation Profession in the European Union, European Commission. Tseng, Joseph (1992) Interpreting as an emerging profession in Taiwan — A sociological model, MA thesis, New Taipei City, Fu Jen Catholic University. Tryuk, Małgorzata (2009) “Początki przekładu ustnego w Polsce. Pierwszy etap profesjonalizacji rynku” in 50 lat polskiej translatoryki, Krzysztof Hejwowski, Anna Szczęsny and Urszula Topczewska (eds), Warszawa, Instytut Lingwistyki Stosowanej, Uniwersytet Warszawski: 57–66. Wilensky, Harold L. (1964) “The professionalisation of everyone?”, American Journal of Sociology no. 70(2): 137–158. Witter-Merithew, Anna, and Leilani Johnson (2004) “Market disorder within the field of sign language interpreting: Professionalisation implications”, Journal of Interpretation 19–55. Zieliński, Lech (2011) “Egzamin na tłumacza przysięgłego a norma i jakość przekładu tekstów prawnych oraz prawniczych”, Rocznik Przekładoznawczy. Studia nad teorią, praktyką i dydaktyką przekładu no. 6: 117–130. The literature on the subject records debates over the usage of ‘training’ versus ‘education’ in the context of translation, introducing a duality of pedagogical approaches and concepts. While understanding ’translator education’ as a component of the broader and more humanistic approach than ‘translator training’, I nevertheless use the two terms in the article interchangeably in order to overcome unproductive dualism. ‘Translator’ is used in the article as an umbrella term to encompass activities that include both traditional (written) translation and interpretation as well as a variety of more novel roles from terminology mining to post-editing. As certification involves granting recognition which has important bearing on an individual’s career it can be classified as a high-stakes examination. Thus designing testing instruments requires due attention and consideration of some premises of educational measurement. In such context Point 6 is far from exhaustive as it lists only some of the aspects that are particularly relevant from the perspective of test takers and translator education. ACT of 25 November 2004 on the Profession of Sworn Translator, Polish Journal of Law, Dziennik Ustaw, 2004, No. 273, item 2702). The candidate is required to be a citizen of Poland or of an EU member state. (Other provisions are also available). An educational requirement concerning an MA degree in languages or any area combined with a post-graduate diploma in translation was abolished in 2011 as part of a larger policy to ease entry to some professions. This change has been criticized by TEPIS, The Polish Society of Sworn and Specialized Translators. Specified in the Minister of Justice’s Regulation. Certification is granted for life unless reasons for suspension or withdrawal of authorization take place, such as professional misconduct (Act on the Profession of Sworn Translator). ATA (h_ p://www.atanet.org/certification/aboutcert_overview.php, 15 September 2012). As of writing this article, to the best of my knowledge no degree programme aimed exclusively at future sworn translators was available (such training is usually offered at a post-graduate level). As translator education is set mostly in academic environs, due to the institutional framework many of teachers or educators may also be researchers (in some contexts - even predominantly). I am aware of the diversity of the actual profile of translator trainers, yet would like to stress employment constraints which, as in the Polish case, make it difficult to employ individuals (professional translators) not set on an academic career.